Winter in the Northern Hemisphere came in like a lion and is on its way out like a lamb, it would seem. Early in the WSL Big Wave Tour season, back-to-back swells in the Atlantic and Pacific lit up Nazaré and Jaws like Christmas trees in the late fall. But, Mother Nature’s been less cooperative in delivering waves to California’s premier big wave spot, Maverick’s, the third stop for the men and second stop for the women on the BWT. Late Wednesday, WSL Big Wave Tour Commissioner, Mike Parsons, followed up last week’s “Maverick’s update” with another, bleaker report. 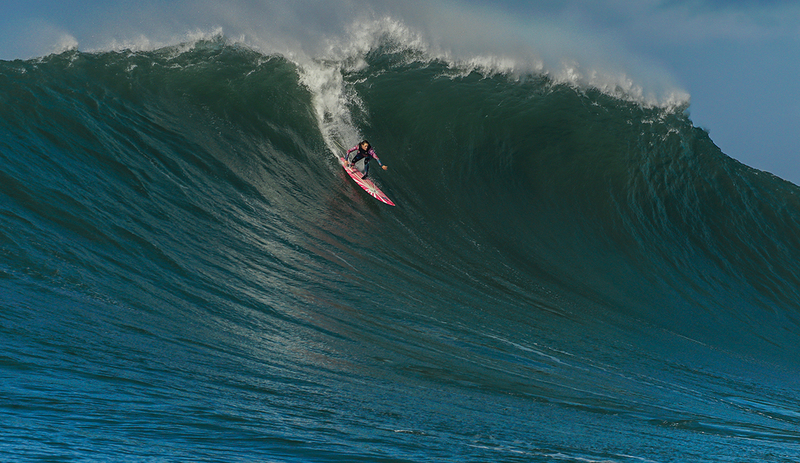 Barring something crazy – which, with surf forecasting and modeling as sophisticated as it is these days appears unlikely – Keala Kennelly and Grant “Twiggy” Baker will be crowned BWT champs during the Big Wave Awards on May 2. The World Surf League purchased the permit to run an event at Maverick’s from Cartel Management (the organizers behind the Titans of Mavericks contest) back in 2017 for a whopping $525,000. So far that investment has yielded zero returns as the League has been unable to run an event there in the two years since its purchase. According to our reporting, the WSL holds the rights until the 2020-21 winter season, that is, if it doesn’t sell them off before then. The story of contest permitting at Maverick’s in recent years has been one mired in controversy while few contests have actually run. Even before the WSL took over the event, Cartel Management famously refused to hold a single heat featuring women until the Coastal Commission forced their hand. Cartel was also accused of defamation in a lawsuit that was later withdrawn. And in 2017, the company filed for bankruptcy as its principals were being sued by Red Bull for “breach of contract and unjust enrichment.” In the three years that Cartel was permitted to hold an event at Mav’s, the Titans contest ran only once in 2016. Since the WSL took over, Maverick’s became a battleground for pay parity – an initiative the League ultimately rolled out across its multiple tours but refuses to admit Maverick’s spurred. And yet, the Maverick’s Challenge hasn’t run in the two years it’s been on the schedule for the men’s and women’s BWT. So, with two years of WSL permit ownership down, no contests to speak of, and two more years to go, the question remains: what’s the future hold for a Maverick’s event? Will the WSL hold on and hope the North Pacific cooperates over the next two years or cut its losses and sell off the permit to the highest bidder at a fraction of what it originally paid? Who’s to say, but I imagine this very question will be the subject of many a WSL meeting in the coming months. We’ll keep you apprised of how things shake out.